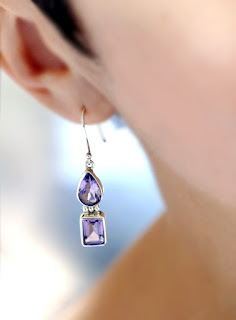 The Earring Collection: Shorter days = longer evenings! Shorter days = longer evenings! All things dark and mysterious seems to be the trend for this Autumn/Winter. We're savouring rich burgundies and deep plum tones. Purple is definitely the new black. Take your pick from shades of lavender, aubergine, lilac and amethyst and drift into a purple haze. We particularly love the return of amethyst; rich, forever regal, and always luxurious.